Warbler Cottage07766 052644work Self-cateringWarbler Cottage is a beautifully presented new build home within the small, exclusive Langham Hotel Development - the conversion of the old Langham Glassworks. Located to the rear of this development, this cottage is set in a very quiet location backing onto open playing fields. The house offers "upside-down" living with the upstairs reception space extending to the entire ground floor area of the property, an ideal entertaining space or for family gatherings - it is modern and spacious but has a very comfortable and cosy feel. Wide oak staircase leads up from the hallway to a spacious open plan reception room with two large three/four seater sofas, 43" flat screen TV, Humax Freeview recorder and blu ray DVD player. The reception is open to the dining area and a large well appointed kitchen. This is a lovely, bright double height reception room that has been furnished in a modern style and to ensure comfort. There are French doors with julienne balcony overlooking the very private garden. The kitchen has granite worktops with a breakfast bar and four stools, plenty of storage and a double butler sink; it has a Rangemaster double electric oven and hob, dishwasher, microwave and American style fridge/freezer with water and ice dispenser. It is extremely well equipped for dining and for cooking - as well as for children - as we use the house ourselves. There is a snug / TV room off the reception room which can be used as a TV/quiet room. This room has a 40" flat screen TV with built in Freeview, DVD player and a Play station 3. There is an excellent selection of games as well as high speed WIFI, DAB radio, 6-port charger and Bluetooth Music Dock. Downstairs are three bedrooms, two with ensuite shower rooms plus a family bathroom. The large master bedroom overlooks the garden and has a super king bed, a built in cupboard and large chest of drawers. The second double bedroom has a king size bed and double wardrobe and also overlooks the garden. The third is a double size room but furnished with full single size bunk beds, dressing table and chest of drawers. The two luxury ensuite shower rooms are fully tiled each with a spacious shower cubicle. There is a separate fully tiled family bathroom with large bath with a shower over and a glazed shower screen. Egyptian cotton bed linens and fluffy bathroom towels are included (no beach towels are provided). Separate utility room with a washing machine and a dryer. We welcome babies and young children. For families travelling with children there is a travel cot, high chair, foam armchair, stair gate, potty and step (there are some blankets for the cot but please provide your own cot bedding). There is also an audio baby/child monitor and some sliding cupboard locks. The kitchen is also well equipped to cater for children. The house is fully cleaned between lets by a professional housekeeping company. All heating (under floor) is included in the price, as is high speed broadband and all bedding and towels - beds are all made up for arrival. You will also find essential items such as various teas, coffee, sugar, oil, salt & pepper, dishwasher tabs, washing up liquid and cloths, T-towels, cleaning essentials, bin liners, cling film, foil, kitchen roll and detergent for a couple of washing machine loads and a small welcome basket. There is a private fenced garden to the rear bordered by mature trees - accessed via a side alley that runs under the reception room. The garden is terraced and has a high quality 6 seater table and chairs set, cantilever parasol and a Weber BBQ. A large lockable shed contains children's garden games, spare garden chairs, beach equipment and room to store your bikes. Parking for two cars is immediately in front of the property with additional visitor spaces located on site. Warbler Cottage is a beautifully presented new build home within the small, exclusive Langham Hotel Development - the conversion of the old Langham Glassworks. Located to the rear of this development, this cottage is set in a very quiet location backing onto open playing fields. The house offers "upside-down" living with the upstairs reception space extending to the entire ground floor area of the property, an ideal entertaining space or for family gatherings - it is modern and spacious but has a very comfortable and cosy feel. Boutique hotel with pool, spa facilities, bar and restaurant due to open 2017. The house is fully equipped and very comfortable to make it feel like a home from home. 5 Star Gold rating. Children welcome from any age. A short drive (5-10 mins) to the A148 road to Cromer and a mile from the Coast Road. Full directions will be provided on booking. 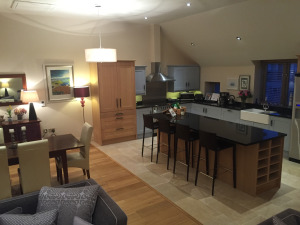 It is a modern house built to required specifications but probably not best suited to wheelchair users as it is arranged over two levels, with the living area being upstairs.